Finally, here is that surprise that I've been promising you all for so long; European Beer Challenge beer #52! Föroya Bjór is one of only two breweries on the Faroe Islands - and finally I have been able to track one of their beers down! I stumbled across this beer in the Delirium Cafe in Brussels. They had stocked it for their World Record attempt at stocking the most different bottled beers, which was successful in 2004. This brings us to the big caveat in this review - the beers best before date was over 8 years ago... Unsure when else I would see a Faroese beer I took the punt thinking; at least it's a brown ale not a lager, it might still be drinkable. Still slightly unsure about the beers longevity I cracked the cap with some trepidation. Thankfully my first fear was ticked off straight away, the beer was still quite nicely carbed. Due to it's fast dissipating nature, you'll have to take my word on it but the head was creamy coloured and about a finger high, it settled to a thin rim within a minute of pouring. The colour of the beer was very reminiscent of coke, a transparent brown colour with mahogany notes when held to the light. Onto the nose and there is no obvious signs of skunking, the guys at Delirium Cafe clearly looked after this well! Rockall has quite a sweet nose, which is predominantly made up of caramel malt aromas. There is also a hint of chocolate and some dark fruit flavours. I didn't get much in the way of hop aromas , but that is hardly surprising given it's age. 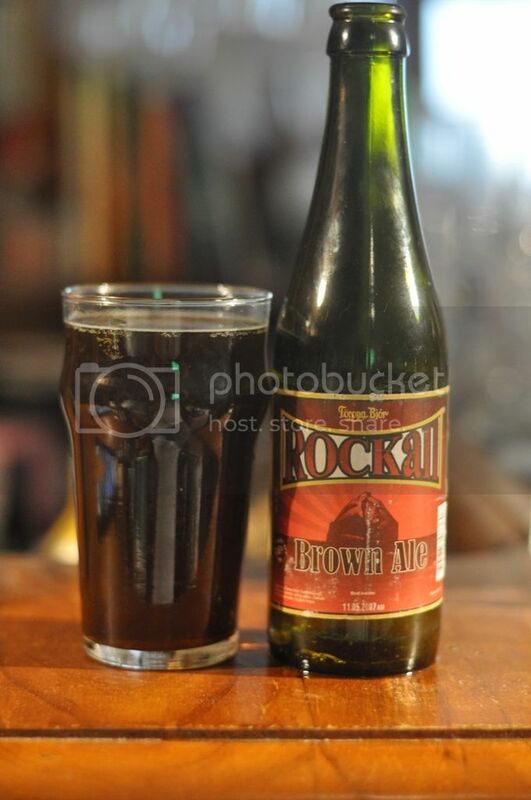 Rockall tastes like a like a mid-priced Brown Ale. The tastes mirrors the aroma with caramel malts the dominant feature. Once again there are some other malts, a bit of chocolate and a hint of roast, present. I still could taste a bit of cherry or raisins towards the backend as well as just a touch of acidity, possibly the only sign of the beers age. The body is a little thin and it's probably just a tad under carbonated. All things considered I'm thrilled with the Föroya Bjór Rockall. Not only have I been able to tick off another country in my European Beer Challenge, but if it wasn't written on the bottle you'd have no idea it was over 8 years (3083 days) past it's best before date! This beer has held up remarkably well and I'm pretty sure would be the oldest beer I've ever sampled. I'd be pretty keen to try a fresh beer from the Faroe Islands - maybe one day... But for now the Faroe Islands are ticked off, just two countries to go! If anyone can help with Kazakhstan or Armenia please let me know!